13 inch Heavy Duty Carpet Cleaning Bonnet with Agitation Strips | Buy Bonnets Online! 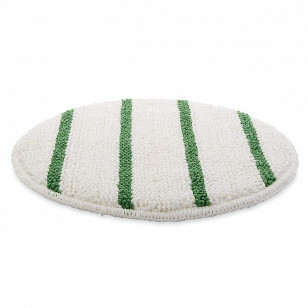 This heavy duty carpet bonnet has green agitation strips that work great for cleaning highly soiled traffic areas. Each bonnet can be used on both sides and rest directly onto a pad holder that attaches directly to our 13 inch 175 RPM floor buffing machines. These bonnets are sold individually. Also, check out our money saving carpet scrubbing packages. They start at the 17" size, but something larger than 13" might be just what you need. 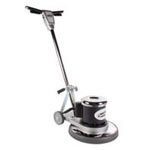 Here are other sizes of low speed floor scrubbers that can be used for carpet cleaning and bonneting. Sizes range from 12 inches all the way up to 20 inches. For additional styles and sizes of bonnets, please feel free to look at our full selection of floor buffing carpet bonnets. No complaints, seem like it will last while.